It is not every day that 35 post-graduate students from 21 countries have the opportunity to travel to a new country, partner with local organisations and policy makers and learn from the urban policies and practices at play there. In May 2018, this opportunity was presented to us through our MSc Urban Development Planning field trip. After months of desk-based preparation, we left London for Colombo (Sri Lanka) with only one certainty in mind: we were going to learn, not to solve. Our ambition was to listen to the city and reflect on what the different voices were telling us. Guided throughout by Sevanatha Urban Resource Centre, a local non-governmental organisation (NGO), our work in Colombo focussed on exploring upgrading and resettlement in the context of an active state-led Urban Regeneration Programme (URP). 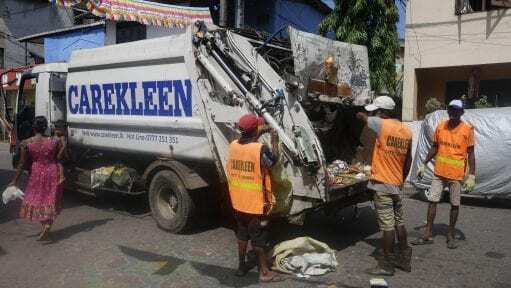 The URP aims to deliver a slum-free Colombo by 2023 by moving 75,000 households out of so-called under-served settlements and into high-rise housing projects. Implemented by the Urban Development Authority (UDA), the programme’s financial model rests on a combination of end-user repayments and market cross-subsidy generated by the release of liberated land for private sector development. Working in collaboration with recent planning, sociology and social work graduates from three local universities, our research benefited from in-depth discussions with affected local communities; face to face meetings with government officials; as well as structured inputs from a host of Colombo based experts and activists. Based on these experiences, we were able to build up nuanced understandings of how urban and housing policies operate at different scales in Colombo; problematise the under-served settlement and slum-free discourses; and begin exploring cracks for alternative urban development approaches in the city. 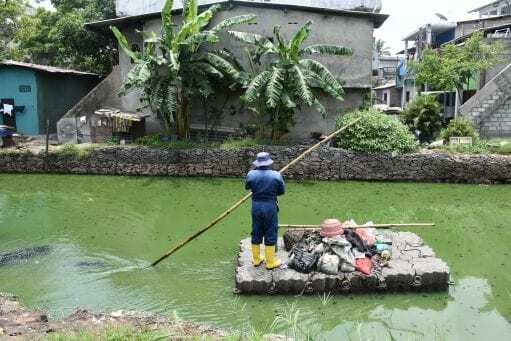 During our time in Colombo, we were encouraged to blend an appreciation of theory with an awareness of how urban practices get materialised in the city. This approach helped unpack relationships between different actors; and exposed the differential impacts of vested interests and influences at different scales. We worked with communities from across three sites in Colombo – Muwadora Uyana, Nawagampura and Mayura Place – and each contributed uniquely to our picture of the city. In the case of Muwadora Uyana, we chose to investigate how the Urban Regeneration Programme had impacted the quality of life enjoyed by those families and individuals who had been moved from settlements across the city into the high-rise housing complex that is Muwadora Uyana. As far as possible, and given the limited research time available, our (action) research and propositions were guided by the ideas and themes that arose from initial discussions with residents themselves. This approach enabled us to identify what quality of life meant to the relocated residents; avoiding the imposition of a normative framing. Building out from this embedded definition; we pursued a mixed-methods approach comprised of floor by floor spatial analysis; participatory mapping with young people and children; and semi-structured interviews with over 30 residents. 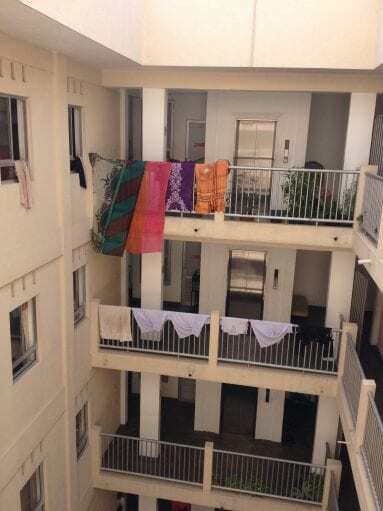 In so doing, we were able to unpack why it was that some people who are relocated into high-rises are able to thrive, whilst others struggle to survive. As well as highlighting the importance of embedded research and face-to-face dialogue with effected communities, this project served to challenge the assumption that all people have the capacity to adapt to living in high-rise conditions. In fact, for many groups and individuals, their agency for adaptation is limited. As such, by introducing agency as a crucial determinant of quality of life, our research problematised the fairness argument often-used to defend a relocation policy based on standardised, one-size-fits-all apartments. Indeed, we argue that this reframing creates space to consider alternative options for both current and future residents alike. Nawagampura is a thriving neighbourhood originally established as a relocation site under the Million Houses Programme in the 1980s. Over the past 35 years, the settlement has evolved and consolidated, stitching its residents into the fabric of the city. However, despite its centrality, the buzz of daily economic activity, and residents’ access to a range of services and facilities, the neighbourhood is still classified as underserved. In the main, this classification relates to the fact that many residents still lack secure tenure; although a number of structures also lack individual toilets and others suffer from periodic flooding issues. The diversity in residents’ experiences and opinions of their neighbourhood served as an interesting point of departure for our research. In the context of state-led efforts to transform Colombo into a world-class city, all neighbourhoods classified by the state as underserved have been slated for future relocation. 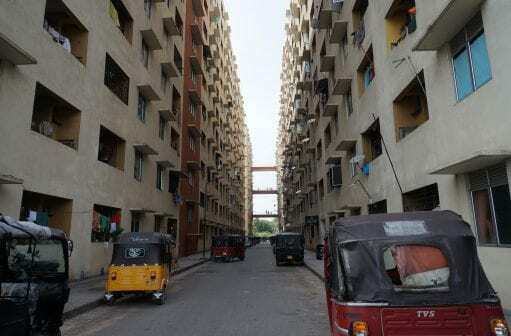 Though not under imminent threat of relocation, Nawagampura presented a rare opportunity to challenge the stereotypical depiction of underserved settlements and communities that underpins much of the state’s thinking around resettlement in Colombo. Working directly with residents, community-leaders, and members of resident-associations we sought to provide a more nuanced picture of the challenges and opportunities associated with living in settlements such as Nawagampura. By helping reframe underserved settlements as complex and varied communities, this approach allowed for the development of grounded strategies in defence of in-situ upgrading as a just alternative to one-size-fits-all relocation. Mayura Place (or Lakhmutu Sevana), sits at the edge of an area previously dominated by textile mills and weavers’ colonies. With the wider site long since shuttered and cleared for luxury real estate development, Mayura Place development is often depicted as a success story of the UDA’s Urban Regeneration Programme’s (URP); an exemplary demonstration of how underserved working-class communities can be successfully resettled into purpose-built high-rise towers. However, as our research unfolded, a more complex picture began to emerge. On the one hand, the experience of Mayura Place residents reinforces the value of keeping communities together during relocation from horizontal settlements to high-rise apartments, as well as relocating communities as close as possible to their original homes. Such an approach, contrasting with larger URP projects that drew residents from across Colombo and constituted new communities through a lottery allocation process, has clearly limited the disruptive impact of relocation on the social fabric of Mayura Place and offers valuable learnings for the UDA. On the other hand, a number of issues were brought up in discussion with inhabitants, questioning the ‘success story’ of Mayura Place. In particular, many residents are grappling with the shortage of common and private space necessary to realise a dignified existence, whilst the appropriateness of high-rise living for certain household industries was raised by a number of our interlocutors. Importantly too, the extent to which the burden of management and maintenance is born equally between residents and the UDA remains unresolved. Meanwhile, there remain serious issues regarding the fact that not all of the original Mayura Place community received rehousing in this block, due to an inconsistency between the UDA’s apartment for a house replacement policy and the reality of multi-family occupancy in former dwellings. Additionally, for those who have received replacement housing, many still lack official documentation recognising their right to secure tenure status. Whilst our discussions with the UDA hinted at an apparent openness to debate and institutional learning, it remains to be seen how far this is constrained by the programme’s overarching ambition to liberate commercially valuable land and beautify Colombo. 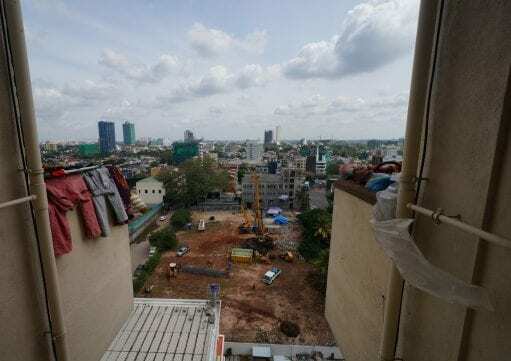 Overall, when considering the exceptionality of Mayura Place within the UDA’s broader urban regeneration programme, it is important to look beyond the façade and embrace this case in all its complexity. Working across three distinct communities in Colombo provided a unique insight into the overlapping processes of regeneration, resettlement and upgrading at play in Colombo. Whether working in Muwadora Uyana – a labyrinthine high-rise housing complex home to 5,000 residents from across Colombo; Nawagampura – a vibrant working-class neighbourhood that is still classified as underserved despite significant upgrading initiatives; or Mayura Place – a former weavers colony now verticalised and stacked within Colombo’s largest luxury residential enclave – it was clear that the voice of Colombo’s diverse communities was almost entirely missing from formal plan-making in the city. Community-led Building Management – Increasing Transparency through Community Contracting: Building on Sevanatha’s existing experience with community-contracting models, this strategy was proposed for two reasons. First, to recognise the capacity of relocated residents to take ownership of common areas within high-rise developments; and second, to increase transparency around the way in which UDA-controlled maintenance funds are currently deployed. Learning Platforms – Bringing People to Policy: This strategy was designed to help systematise and extend the existing learning practices employed by the UDA through the creation of multi-actor learning platforms. These platforms would institutionalise multi-directional communication between actors from the state (UDA, Colombo Municipal Council etc. ), representatives from academic, activist and civil society organisations, and local communities. By bringing together conversations and relationships that currently exist in isolation, this strategy aims to build synergies between actors helping identify and resolve issues within existing housing stock and planning processes and allowing the lived experience of residents to inform forward looking policy and design decisions. Changing Planning Language – Challenging the discourse of Underserved Settlements: Building on Sevanatha’s earlier mapping of Colombo’s underserved settlements, this strategy proposed the development of neighbourhood profiles (based on resident survey data, asset and risk mapping, documentation of upgrading etc.). These profiles would then be used to both challenge the idea that all underserved settlements suffer from an identical set of challenges; and strengthen the negotiation position of communities in the context of relocation. Embedded in the lived experience of three specific communities, the tentative strategies proposed during this project sprung from a common source – the need to reintroduce complexity, diversity and fluidity into a planning context intent on sorting Colombo into the static, binary categories of underserved and regenerated; world class and working class; planners and the planned for. By failing to account for the multiple realities and capacities of Colombo residents, this reductive framing shuts down the space to think differently about urban development in Colombo and encourages the proliferation of top-down, standardised development models. In contrast, a reframed understanding of Colombo’s communities as dynamic, diverse, capable and connected creates room to advocate, adapt and evolve planning processes towards the achievement of more just, people-centred development. This reading of Colombo planning resonates strongly with ongoing work by academics, activists and civil society organisations in the city, some of whom are already actively engaged in efforts to develop and convey this message onwards to decision-makers. In this way, the fieldwork project enabled the DPU to add its voice to a growing call for more socially, spatially and environmentally just development. Lastly, we would like to express our gratitude for the fantastic support provided by the MSc UDP staff team as well as all of our project partners in Colombo. In particular, special thanks is owed to Chularathna Herath (Executive Director of Sevanatha Urban Resource Centre) and Ruchika Lall (DPU alumna and DPU/ACHR/CAN Young Professional).